Dietrich Bonhoeffer, the Lutheran pastor and theologian murdered by the Nazis less than a month before the end of the Second World War, was a great lover of America and Americans. He studied under Reinhold Niebuhr — whom he didn’t much like, according to Martin Doblmeier’s biographical documentary, Bonhoeffer — at Union Theological Seminary in New York and could have spent the war in safety here, but that he thought his place was in his native Germany. He caught the last boat back home before the commencement of hostilities. 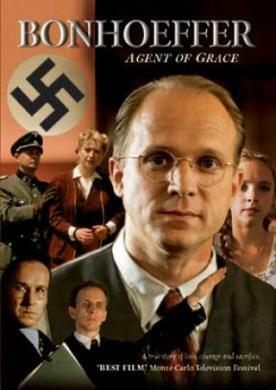 Doblmeier makes much of Bonhoeffer’s involvement in the plot against Hitler which culminated in the assassination attempt by Colonel Claus von Stauffenberg and others in July of 1944, but he seems to have had no active role in it and to have been arrested mainly for being a friend of the conspirators. The result is a certain reaching after effect in the voiceover narration which occasionally becomes annoying, as when we are told that "in September, 1930, as Hitler continued his rise, Dietrich Bonhoeffer sailed aboard the Columbus for New York." Well, yes, but I’m guessing he would have sailed to New York whether Hitler had been on the rise at the time or not. Such hints that his subject was a kind of international man of mystery are presumably Doblmeier’s way of making him more interesting to audiences whose knowledge of the Second World War comes mainly from movies, and whose prejudices lately seem to run counter to religious heroes. Like Bonhoeffer’s love of America and especially of black gospel music as he first experienced it at Adam Clayton Powell Senior’s Abyssinian Baptist Church in Harlem, they may make him more appealing to today’s America, but they are much less important than his theology, on which the film spends surprisingly little time. To be sure, it’s not exactly easy to present theology in a cinematically engaging way, but Bonhoeffer’s ought to lend itself to such treatment better than anyone’s. The reason he didn’t much like Niebuhr, for instance, is that he thought him too much the philosopher and moralist for someone like himself who was a devotee of the Christocentric theology of Karl Barth. Doblmeier mentions this, but does not go into the implications of it for Bonhoeffer’s attitude towards the war, and war in general — which was both radical and contradictory. That is, he was both a pacifist who always intended to go to India to study non-violence with Gandhi and at the same time, if not an assassin himself, a sympathizer with assassins. Niebuhr had written a classic defense of the just war in Moral Man and Immoral Society, but his analysis was influenced, like so much else during the period, by Marxian economics. Bonhoeffer by contrast, believed in the literal meaning of the Sermon on the Mount as a guide to living — an idea as radical now as it was then and has always been. Thus, the tortured process by which this man of God and of non-violence came to approve of murder — and its implications for his moral thought — ought to have been worth more attention than Doblmeier has to give it. Likewise he seems inclined to credit the view that the church was guilty of "preparing the foundation for Hitler" simply by its patriotism, a view of the matter which may have made sense at the time but in retrospect does not take account of the uniqueness of Hitlerism. Still, Bonhoeffer comes across here as an appealing character, not least because of what he shared with most great religious revolutionaries: namely the idea, as one of his surviving students interviewed by Doblmeier puts it, that " we had to read the Bible as if it was directed to us, here and now" and "throw ourselves completely into the arms of God." To him, the Christian revelation meant that "Whenever Christ calls us, his call leads us to death" — an idea so far out of keeping with most religious thought today that you’d think Doblmeier would have made more of it, if only for its shock value. But for those with an interest in the moral and religious response to Naziism in Germany, this will be a welcome documentary about an indispensable character in the story.